Christmas is sneaking up on me, I have so many things to do. Plus it’s weirdly warm, which actually doesn’t have the best effect on my moods, since I’m a weird backwards person. Good thing I’ve got lots of books to read. Furiously Happy by Jenny Lawson. While the opening author’s note is incredibly promising, I’m not finding this book quite as laugh-out-loud as other funny memoirs that deal with the author’s mental illness, like Hyperbole and a Half. Of course, I’m still snorting throughout, something that’s actually quite hard to make me do while I’m reading, and I’ve had a few parts where I released such a weird laugh my husband actually looked at me with concern for a moment before going back to playing Star Wars. Plus, Lawson has given me inspiration for another book idea that’s been kicking around in my head, because I am an author and I am always trying to steal ideas. The Unbeatable Squirrel Girl volume 2 by Ryan North and Erica Henderson. I keep carrying this around in my purse, though I’ve barely broken into it. (It’s great for truncated lunch room reading at work.) While I really enjoyed the first volume, it’s not my favorite-favorite thing, so maybe that’s why I didn’t immediately rip it open when I got it into my grubby mitts like when the last volume of Saga came out. 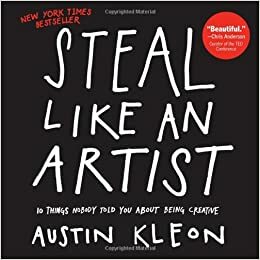 Steal Like an Artist by Austin Kleon. Remember how I said I steal things? This book makes me feel not so bad about it. I already mentioned that I’m rereading this one. Mostly, I’m trying to up my creative productivity, and having a book like this to thumb through at my desk is helpful, rather than distracting, like you’d think it would be. Plus it’s a book I don’t mind defacing, and it’s oddly cathartic to take a Sharpie and a highlighter to something. That’s what I’m pawing through right now. What are you reading?